Note: This piece is in Paste Quarterly #1, which you can purchase here, along with its accompanying vinyl Paste sampler. Not only is Kicukiro Oval, the name of their field, an area deeply rooted in tragedy, it’s also unsuitable for sport. The field is made up of one concrete wicket tossed over worn matting; an old, overused, uneven concrete net which is “liable to take your head off,” according to the team’s website; and a basic shed to house the limited equipment the cricketers have and provide shelter when it rains. The outfield is dotted with ant nests and holes that make fielding dangerous. They certainly can’t host games against other African teams on their ground, and they don’t have enough money to play elsewhere. It’s unsafe to bowl on, and limiting, to say the least. So, when Eric, who also happens to be the general manager of the Rwanda Cricket Stadium Foundation (RCSF), found out he could raise £15,000 (about $18,000) for a new stadium by breaking the Guinness World Record for longest individual cricket net session, he decided to take on the task. For many Rwandans living outside the capital of Kigali, sport is rolling up some plastic or anything durable, finding something to tie around it so that it doesn’t lose its ball-like shape, and kicking or throwing it around. Maybe even hitting it with a stick. And while cricket hasn’t reached the countryside just yet, it was even less popular in Rwanda before the genocide. Refugees brought the game back home from countries like Kenya, Uganda and Tanzania. In 1999, a small number of former exiles founded the Rwanda Cricket Association (RCA), and in 2003, Rwanda became an Affiliate Member of the International Cricket Council (ICC). The sport’s growth is not only good for the Rwandans who yearn to play cricket professionally, but also for the country. “After the genocide, sport was one of the key things to bring back hope, morale and a sense of unity,” Eric says proudly. Rwanda’s national team is made up of survivors from both sides of this three-month period, when members of the Hutu community targeted and killed thousands of Tutsi people. Over just 100 days, 800,000 to 1 million people from both sides were slaughtered, according to the Rwandan government. A recent analysis conducted by the Student Genocide Survivors organization estimated the number to be closer to 2 million. And though not everyone in country has gotten over the devastation that took place just two decades ago, those dying tensions don’t get in the way of the game. In fact, playing cricket has helped them reconcile. “We have several Hutu and Tutsi players on the same team; the national team is a real mix,” Alby says. “You talk to any of them and they believe the game is playing a part in the healing process, as it promotes unity.” Because of cricket they now see themselves as Rwandan rather than Hutu or Tutsi. The genocide didn’t directly affect the team’s leader. “I was six years old during the genocide, the youngest of six siblings. We lived in Kigali, but my dad sent half of the children up-country and remained with three in Kigali,” Eric says. He stayed with this parents in the capital, while some of his siblings went to his grandmother’s house in the Rusizi district in Western Province, Rwanda. “He wanted to take the whole family to our grandmother, where he thought that we would be safer than being in town,” he reveals. One day there was a bus that was heading up-country, but they obviously weren’t the only ones trying to flee to safety. Getting on the bus was hard, a fight, as Eric describes it, and only three siblings managed to enter. Luckily, everyone was safe and his entire family survived. While his family was spared, his memories weren’t. “As a kid I didn’t fully understand what was happening, but I realized that things were not normal; seeing dead bodies, hearing sounds of guns and bombs,” he recalls. As a young child, who simply wanted to enjoy life, he began to fear that he could no longer do what children typically do in their neighborhoods: play. However, other team members suffered worse. For instance, Byiringiro Audifax, the opening batsman, lost his father and brother. Eric is one of 200,000 to 400,000 survivors of the genocide, according to the Rwandan Ministry of Social Affairs and the IBUKA survivors’ organization. I first met Eric, who is both humble but jovial, in Rwanda about five months after he broke the world record. It was October in Kigali; I had just left the Kigali Genocide Memorial, significantly more disturbed than I had been earlier, and my guide asked me if I wanted to see what would be the country’s new cricket stadium and meet the man changing the country by way of sport. Our jeep bumped its way onto an open field/construction site filled with soil as gold as Dubai’s desert sand, a handful of construction workers and trucks sprinkled throughout the 11-acre plot. Eric was not dressed for cricket or construction; instead he wore a denim fitted button-down shirt and khaki pants, his muscular build threatening to burst the seams. He shook my hand and presented his pearly whites. He was perfectly poised to talk to a couple of prying journalists; he carried himself like a captain. The Kigali native joined the team in 2008, only three years after falling in love with the sport at the age of 18. Originally, he had planned to be a civil engineer or architect. One day during his studies he noticed the relationship between cricket, math and physics, and decided to take a shot. Turns out he was really good (proof there is a reason for math class). When he was selected for the national team, he realized he could “take the game far,” as he puts it. He became the team’s captain in 2011 and RCSF’s general manager in 2016. “I have decided I will only play competitively 10 more years, but the rest of my life will be associated with the game,” he says. 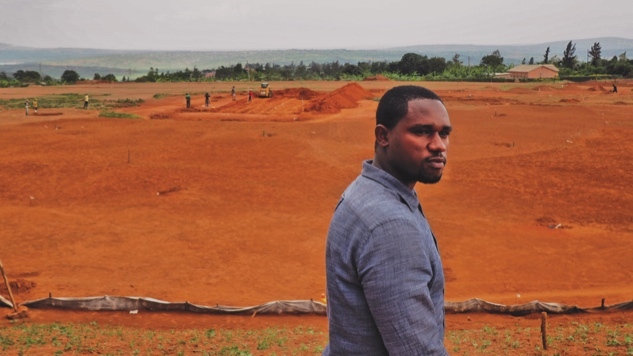 As a civil engineer and GM of RCSF, Eric will play a big part in managing Rwanda’s new “Home of Cricket,” a stadium that was actually Alby’s father’s idea. To Christopher Shale, the only way for the team to claw its way out of the country’s troubling past and meet its full potential was to have new international facilities. A former British army officer, businessman and chairman of the West Oxfordshire Conservative Association, Christopher “loved Rwanda and loved cricket,” his son says. He felt a new stadium was the best way to promote a sport that was clearly playing a large part in the Rwandan reconciliation. Nelson Mandela said, “Sport has the power to change the world,” and Christopher witnessed that happening. He saw how cricket was promoting social solidity in the country. During his time volunteering in Rwanda after the genocide, Christopher also witnessed the growth in enthusiasm for cricket. Unfortunately, Christopher died of a heart attack before he could see his dreams realized, so his sons took over. They founded the RCSF in 2011. With the support of organizations like Volcanoes Safaris, Marylebone Cricket Club Foundation, Banda Property and Surrey Cricket Club, RCSF’s main focus over the last five years has been constructing the first international standard cricket facility in Kigali. Moving forward, their mission is to use the sport to approach challenges facing Rwandans, relating in particular to reconciliation, health, education, gender equality and the protection of children and vulnerable adults. The non-profit foundation started a crowdfunding campaign; so far they’ve raised more than £750,000 of their £1 million goal, thanks in large part to Eric. “When I asked Eric to become my No. 2, he gladly accepted,” Alby says. “We sat down to discuss cricket in Rwanda and came up with this ambitious plan to bring the Guinness World Record back to RCSF.” Alby held the record briefly in 2013 after batting for 26 hours. The goal was for Eric to break the record to raise awareness of the foundation and the sport as whole. At 7 a.m. on May 11, 2016, Eric began what would become a life-changing session in the net. He batted for 51 hours straight, through May 13. To give you an idea, that is 17 times the maximum number of hours the Rwanda cricket team plays in one sitting. In his days at bat, Eric was allowed one five-minute break every hour. He used the time to ice his limbs, get foot rubs and refuel. He received “deliveries” (cricket’s version of a pitch) from former U.K. Prime Minister Tony Blair; British High Commissioner to Rwanda William Gelling; and Miss Rwanda, among others. So, when he hit that wall, he did what any other sensible athlete would do: a headstand. Wait … what? The first thing he did after setting the record was sleep for two days straight. Keep in mind, he did hours of interviews before resting, taking one for the team. As Eric led me on an informal tour of the stadium-to-be, he showed me where the stands, offices, concessions and other free services would be. He beamed showing me the plans for the buildings, the structure of the roof that has multiple curves and represents the bouncing of a ball, so proud of how he tied his two loves together. Construction is going as planned and the opening ceremony is scheduled for October 2017. The new stadium and progression of the sport in Rwanda will offer more than a happy distraction from the past and a game to bond over. The state-of-the-art facility will provide free HIV testing, youth education programs, English lessons, low-cost wedding facilities and, of course, plenty of employment opportunities. It will also host other activities like chess, dance and martial arts. In addition, RCSF has partnered with The U.N. Refugee Agency. Eric and other members of the team promote reconciliation and HIV awareness and teach cricket in Rwandan refugee camps to people between the ages of five and 20. Once the facility is complete, the board plans to invite the refugees to the site so they can continue their education. I know learning a new sport has changed the lives of many Rwandan children. I saw firsthand how excited they got by a ball—they could be without shoes and water, but if their ball rolled out of reach, that’s when they pouted. For Eric, the most rewarding part of being on the national team has been playing with people he introduced to the game, or seeing children he once coached now play for different clubs or the Under-19 league. Clearly, the team made the right choice in making Eric their ambassador. “I introduced cricket in my family, and now my two sisters play on the women’s national team,” he says. Now, Eric is overseeing the construction of the new stadium, which allows him to pursue both of his passions. His face is on billboards all over the country; he’s become the “icon” of Rwandan cricket. People even stop him on the street and ask for pictures. Thanks to the new grounds, the quality of their game will improve, which will allow them to begin playing internationally. And when they play their last game at Kicukiro Oval, they, along with the country that has come to know and love Eric and his team, will be one bowl closer to healing.